2012 marked the seventeenth season for the IndyCar Series. Fifteen rounds would be contested to determine titles for teams, engine manufacturers and drivers. The season opened in late-March at Saint Petersburg, Florida and ended at Fontana, California in September. In between these two weekends, there were races held at Barber Motorsports Park, Long Beach, San Paulo, Brazil, Indianapolis, Detroit, Texas Motor Speedway, Milwaukee, Iowa, Toronto, Edmonton, Mid-Ohio, Sonoma and Baltimore. On the driver front, there were two noteworthy stories. The first was the departure of Danica Patrick as she left IndyCar for NASCAR and the second saw Formula 1 veteran driver; Rubens Barrichello join the series. But the biggest story may have been the new car and engine package. The Dallara IR-05 was replaced with the new DW12 – named in honour of Dan Weldon who had performed much of the development testing. In a continuing effort to keep costs down officials capped the price of the DW12 chassis at $349,000. In 2012, the normally aspirated V8 Honda engines were replaced by a formula that required teams to use a 2.2-liter turbocharged V6 power plant. Supplying motors for the series were Chevrolet, Honda and Lotus. 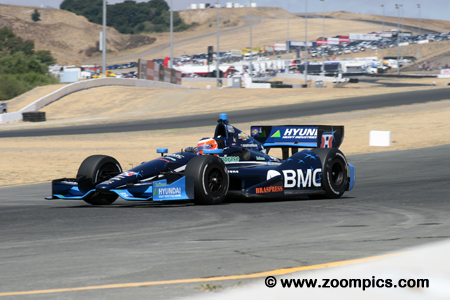 Round thirteen took place at the 2.303-mile twelve turn Sonoma road course located just north of San Francisco. To provide additional passing opportunities the circuit underwent some changes to turns seven, nine and eleven. For fans, this proved to be an exciting event as with three races remaining on the 2012 schedule there were fifteen drivers with a mathematical chance of winning the IndyCar title. 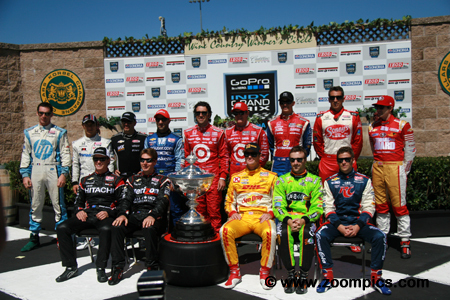 Fourteen of the 15 drivers with a mathematical chance of winning the 2012 IZOD IndyCar Series championship: (LF) Ryan Briscoe, Will Power, Ryan Hunter-Reay, James Hinchcliffe, Marco Andretti, (LR) Simon Pagenaud, Takuma Sato, Oriol Servia, Tony Kanaan, Dario Franchitti, Scott Dixon, Graham Rahal, Justin Wilson, JR Hildebrand and (missing) Helio Castroneves. 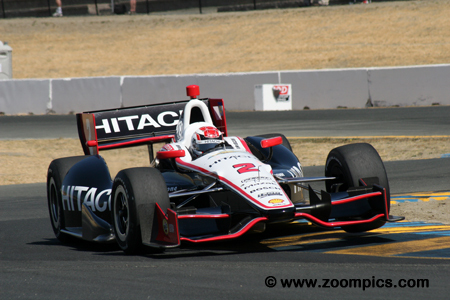 The 2011 Sonoma event saw Team Penske post a sweep of the podium with drivers; Will Power, Helio Castroneves and Ryan Briscoe. 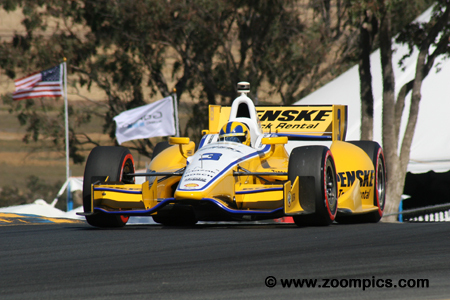 It appeared that feat might be possible again when Ryan Briscoe qualified second making it an all Penske front row. Briscoe trailed his teammate Power for much of the race but on lap-65 beat the pole-sitter out of the pits and went on to score the victory. 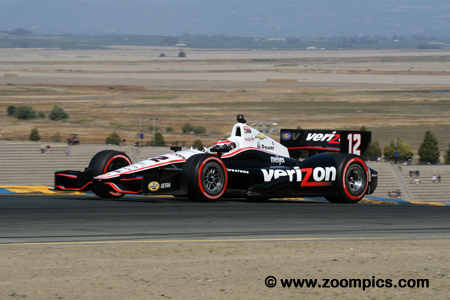 In the first twelve races of the 2012 season Will Power had three wins and entered Sonoma with the points lead. Sonoma had been good to Power as he won the previous two events. The race also marked his 100th Indy Car start. Quick in the practice sessions, Power qualified on the pole – his third consecutive at the track. He lost the race during the final pit stop and finished 0.4408-seconds behind his teammate Ryan Briscoe. Graham Rahal was entered in the No. 38 Dallara by Chip Ganassi Racing. 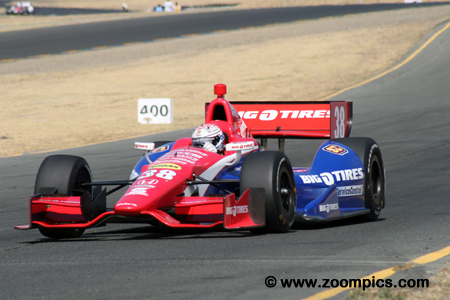 Rahal was gridded in thirteenth place which positioned him mid-pack for the start. A good drive during the race earned him a fifth place finished – the second best performance of the Honda-powered cars. Dario Franchitti qualified his Honda-powered Dallara in sixth. Late in the race, he was fourth behind Ryan Hunter-Reay. On lap-75 Hunter-Reay was bumped in corner-seven by Alex Tagliani. The incident dropped Hunter-Reay to eighteenth and allowed Franchitti to move into third. Franchitti held the position to the checkered flag – earning the final spot on the podium. Quickest of the Honda powered cars was the No. 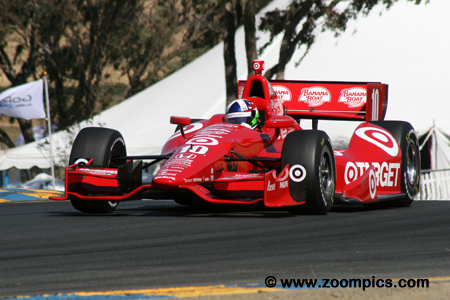 9 Chip Ganassi Racing entry driven by Scott Dixon – he started from the fifth grid position. But from there the event went downhill for the two time IndyCar Series Champion. It started when Dixon received a drive-through penalty for running over an air hose during a pit stop. Next he made contact with Ryan Hunter-Reay. 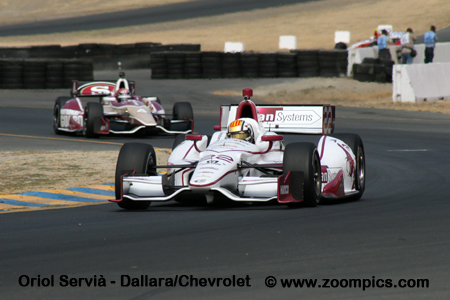 Dixon finished thirteenth but left Sonoma still fourth in points. 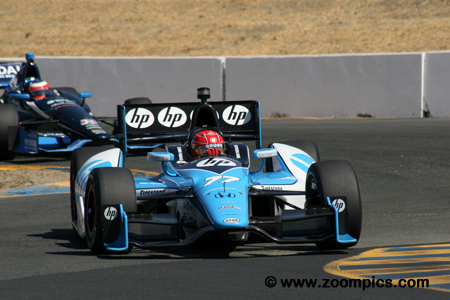 Formula 1 veteran, Ruben Barrichello was making his first start at Sonoma. His best performance of the season was a seventh on the oval at Iowa. 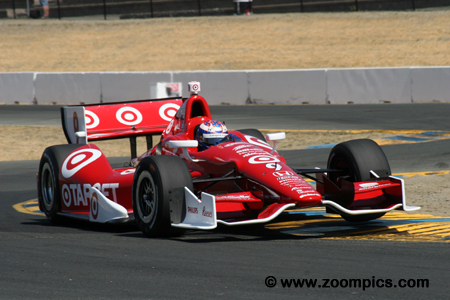 Barrichello started Sonoma from the eleventh position – a better performance than his KV Racing teammates Tony Kanaan and E.J. Viso. During the event, he moved up the race order and at the checkered flag had his best results of the season – fourth. 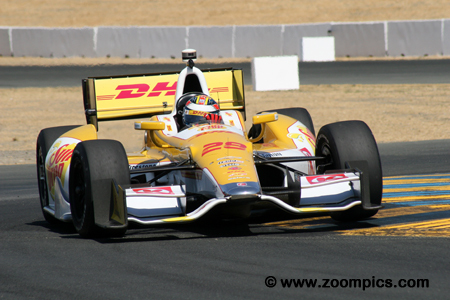 Heading into the Sonoma weekend Ryan Hunter-Reay trailed points leader Will Power by five points – like Power he had scored three victories in 2012. In qualifying, Hunter-Reay turned a time which put him seventh on the grid – he won two races in 2012 from this starting position. He was third for much of the contest but on lap-75 he was bumped by Alex Tagliani and finished eighteenth. With one event remaining in the 2012 IndyCar season Penske driver Helio Castroneves was third in the driver’s standings. At Sonoma, he was the slowest among his Penske teammates but that was good enough for fourth on the starting grid. Castroneves dropped down the running order and was sixth at the checkered flag. Simon Pagenaud driving the Schmidt Hamilton Motorsports Honda-powered entry was quick in the practice sessions but he could only manage a ninth starting position for the 85-lap race. During the event, Pagenaud put in a solid performance and finished seventh. This result earned him the ‘Sunoco Rookie of the Year’ award. 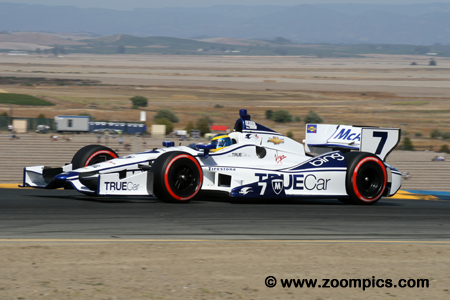 A surprise in qualifying was Sebastien Bourdais who put his Chevrolet-powered Dallara third on the starting grid. On lap-63 Bourdais went off the track but returned and made contact with Josef Newgarden. The incident broke Newgarden’s index finger and forced the pair to retire. Bourdais was classified twenty-second.